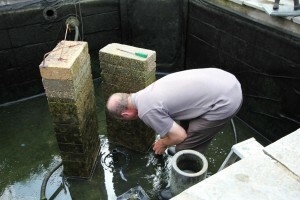 Pond construction today is most certainly easier that it used to be with the advancement of building materials now readily available to us all.We choose to build our pond walls using either concrete blocks or bricks, which are usually available from good builders merchants, but you can also use a liner which we also have experience in constructing with. Brick ponds can then be fibre glassed or rendered and finally painted which will provide you with a reliable pond likely to last for years. Not only do we help assist with the construction of the pond itself, but we also can assist with the layout and input of the filtration system, for example how to incorporate it into your garden without being uncomplimentary. The filtration system is one of the most important components of a pond and so should not be treated lightly as correcting mistakes may cost a fortune. Also you should consider the equipment which you will need to run your pond; pumps, air pumps, UV’s, pipework, filter materials, skimmers etc. All of which we stock and are able to help install and advise during the construction of your pond. We offer many types of pond maintenance to either companies or any private pond owners. As any pond will need regular maintenance to achieve an eco-system balanced environment, we pride ourselves in working with the customer to either provide a one of clean to the complete pond, to maintaining on a weekly or monthly pond/filter schedule. We also provide water testing to check all water parameters, also with fish health checks provided while cleaning pond and filter as required. Other pond maintenance services we can offer include – U/V bulb changing, waterfall cleaning, water features cleaning ,pond hovering, pond weed clearance, pond planting and regular pond water treating with bacteria aids to enhance clear water quality. At Maple Koi, we also provide a high level of consultancy regarding not only the health of your koi but also the maintainance of your pond. No question can be considered unreasonable. Our priority is to ensure that as a customer you have peace of mind. 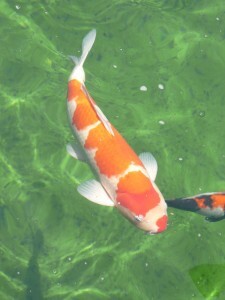 Should anything happen in regards to your Koi or pond then please do not hesitate to contact us. Also in regards to pond building, we are happy to offer professional advice on the more difficult aspects, such as the installation of a filtration system. 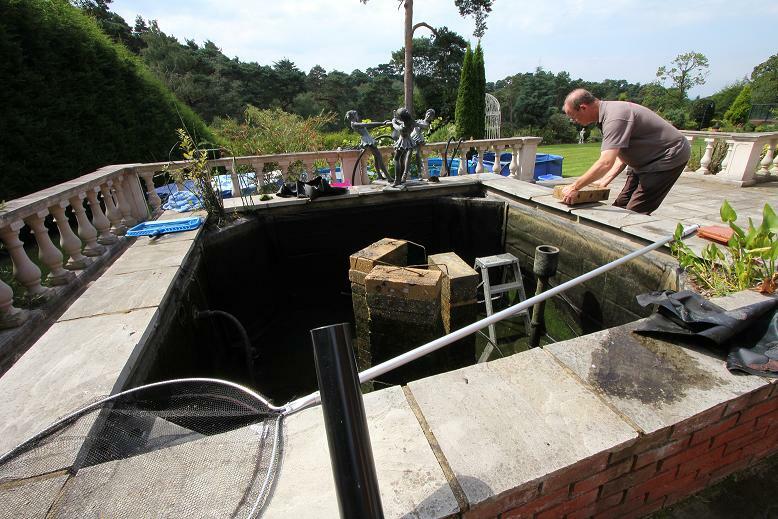 The upkeep and running of a pond can be difficult and a number of complications can arise over time, however we offer a vast range of services in order to help. We clean a variety of ponds, as well as helping to control the growth of blanket weed, cleaning your filter system and landscaping the pond area to maintain a healthy environment. 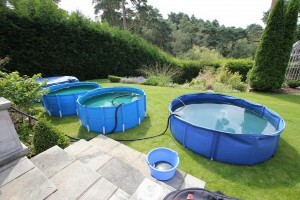 We are also able to make repairs to your pond and filter system should something go wrong. advice at other times over the phone so please feel free to give us a call should you need any on site assistance. There is nothing more worrying than when any of your fish become unwell. Health problems can range from bacterial infections to open wounds, all of which we have had experience in treating. We offer a call out service which allows us the oppurtunity to diagnose the problem and offer the correct treatment. Of course it sometimes is difficult to know whether there is a problem, therefore there are many signs to look out for in order to catch a health issue sooner rather than later. One of the most clear signs is a change in behaviour, such as sitting on the bottom , lethargy, unsettledness, and unsociability. But there can also be physical signs such as lumps and bumps, spine curvature, raised scales, red ‘veining’ and skin blemishes. In order to treat your koi and prevent any infections spreading (should this be the case) we thoroughly investigate the cause of the problem through a number of procedures. We conduct water tests to check that the water quality is not affecting the fish. We examine the particular koi in question, which may involve taking a scrape to observe whether any bacteria is causing illness, and we also take into account the surrounding environment such as plants and materials. Of course, each koi is individual, as can be the problem, therefore we make every effort to identify the cause and do all we can to treat your koi, which is why our call out service is so important and successful. If you are having any fish related health problems, please do not hesitate to give us a call. Moving house can be stressful, but even more so can be moving your koi. We offer a service to make moving house and your koi that little bit easier. Koi transportation is an important service we offer as the stress of being transported can have damaging affects if handled inadequately. We offer a professional service to help settle your koi into their new pond and make their moving that much more smooth. We can provide all boxes, bags and oxygen, and have years of experience transporting koi, importing Japan, and sending them to Kenya. Also, if you are building a new pond, moving house or just need a short/long term soloution to housing your koi we rent a selection of Aquosis Vats Heaters Air Pumps water Pumps all associated pipe work. In fact everything to ensure your koi are kept in a healthy controlled enviroment. Please call to discuss your individual requirements.